We’ve planned some fantastic events for this week and next week! Please come out to as you possibly can and support us! Also, it’s now officially April! And you all know what that means… Earth Day is almost here!! 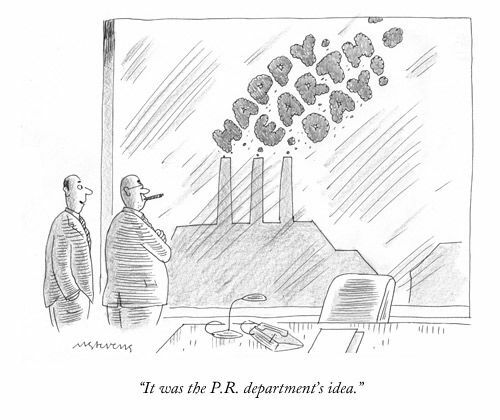 Please enjoy this New Yorker comic in anticipation of all the fun we will have later this month. The Economist “Which MBA?” case competition sponsored by NRG invited teams from universities across the world to submit a proposal to solve an energy issue. A team of Columbia SIPA students has submitted their proposal and counts on your vote to win the People’s Choice Award and beat teams from Duke, MIT, UCLA, and more. Watch the video and cast your vote today! You can cast one vote every 24 hours and voting ends on April 15th, 2017. Join Columbia’s sustainability clubs for a drink! Come join us for a drink with our affiliate Columbia sustainability clubs, including the Environmental Law Society and the Green Business Club at Amity Hall (982 Amsterdam Ave) on April 6th at 6:30 PM. A limited number of drink tickets will be provided. The People’s Climate March will be a major march in support of climate, jobs, and justice. In partnership with student organizations across the NYC area, ECO will provide round-trip transportation at a subsidized cost for a limited number of students. Don’t miss this chance to meet like-minded students and show your support for climate action! Attend a drop-in information session on Wednesday, April 5 between 1:00-2:00 PM in room 823. Stop by our table on the 4th floor on Tuesday, April 4 from 9:00-11:00 AM or on Wednesday, April 5 from 2:00-4:00 PM. Email Darcy at darcy.jones@columbia.edu with any questions. Date/Time: Monday, April 3, 7:00 pm – 8:30 pm. Please join SIPA Energy Association and Environmental Coalition for a discussion on energy and environmental policies under the Trump administration. Since the inauguration of Donald Trump, the energy and environmental sector has seen multiple changes from a policy perspective. Jenik Radon, Founding Director, Eesti and Eurasian Public Service Fellowship and Professor at Columbia University. Jeffrey Ziglar, Founder and Chief Investment Officer, Mecox Bay Asset Management. The panel will be moderated by Diego Hentschel, co-president of SIPA Energy Association. In a report recently published in IOPscience, a team, including two Columbia students, quantifies the emission sources and health impacts of persistently hazardous levels of smoke pollution which covered much of Equatorial Asia from September to October 2015. They then compare the sources and impacts to an event of similar magnitude occurring under similar meteorological conditions in September–October 2006. Using data from these episodes, the team developed an approach to provide an assessment of the relative contribution of fire emissions generated in a specific province to smoke-related health impacts in the receptor areas. Using this framework, the team argues they can now rapidly identify areas where land use management to reduce and/or avoid fires would yield the greatest benefit to human health, both nationally and regionally. Location: Meet at Starbucks at 1411 6th Avenue (between 57th & 58th streets) to pick up visuals and for a quick check-in training at 9:30. Between 9:45-10am we will gradually walk to Trump Tower’s public garden / atrium space. Learn about how carbon pricing is a solution to climate change! This is a creative, impromptu opportunity to elevate the importance of carbon pricing and encourage President Trump to protect our future. More information and RSVP form can be found here. Steven Cohen, Executive Director of Columbia University’s Earth Institute and Director of the Master of Public Administration program in Environmental Science and Policy at SIPA, has an upcoming book about sustainable cities. This talk will include an inside perspective on the book as well as the importance of sustainable infrastructure. His article for the Huffington Post on this topic can be found here. Happy Hour drinks will be provided after the talk! Water is essential to life. An age of unprecedented planetary change demands new strategies to manage this substance upon which nature, nations and neighborhoods depend. Building on our past two conferences focused on the subject of resilience, Water Cooperation and Conflict will convene experts and practitioners from the public, academic and private sectors to discuss collaborative problem-solving strategies for the protection and sharing of water resources, ranging from transboundary conflicts, to local water scarcity, to watershed management. This one-day conference will include prominent keynote speakers and panels covering local, national and global water challenges and solutions. Please check back for more details to be posted in the coming months. Please find more information and registration for the event here. Please join the Center on Global Energy Policy’s Women in Energy program for a public panel discussion on the world of energy consulting. Whether you are a student looking to get into the field or an energy professional, come out to hear from experts in the field on the diverse range of energy consulting clients and projects, ranging from sustainability consulting for local governments to political risk consulting for corporations. The Postdoctoral Fellows program is unique in its mission to train a generation of professionals equipped to address some of the world’s most urgent problems. The symposium highlights the work of current Research Fellows. The Symposium will be presented and moderated by John C. Mutter, Director of Graduate Studies, SDEV Ph.D. program; Director, Earth Institute Postdoctoral Fellows program; Professor, Department of Earth and Environmental Sciences; Professor, School of International and Public Affairs, Columbia University. Please feel free to share the event with colleagues and students who might be interested. To attend this event please RSVP here. The Masters in Public Administration (MPA) program in Environmental Science and Policy (PESP) at Columbia University is seeking a Teaching Assistant (TA) for summer 2017 (30 May – 18 August) for “Earth Systems and Environmental Politics, Policy, and Management” (ENVPU6241_001_2017_2). This course is designed to guide students interested in policy and management towards an understanding of how environmental policies are devised, implemented, and evaluated. It combines lecture with discussion sections and class debates. The class meets each Wednesday for 12 weeks. Preferred applicants will have an interest in and experience with environmental policy and solid writing skills. The position has a salary of $5,500 for the summer term. Please email Sara Tjossem (sft2101@columbia.edu) by April 7, 2017: a cover letter stating your interest, your resume, and a brief writing sample. She will then conduct interviews of applicants. Climate Central is hiring a Program Director to coordinate all aspects of their internal efforts and outreach efforts. ICLEI is hiring a Climate Finance Officer. The United Nations Development Programme is hiring a Programme Specialist in Climate Change and Energy (Panama) and a Sr. Technical Consultant for National Adaptation Plans (Bangkok). Miami-Dade County is looking to hire a Code Compliance & Training Officer (Flood & Disaster Mitigation) with a starting salary of $66,222. Acclimatise is looking to hire Consultants in International Climate Change Resilience and Adaptation in Cardiff, United Kingdom. [IN MIAMI] Fairchild Tropical Botanic Garden is hiring a Fairchild Challenge Elementary Program Coordinator and a Volunteer Coordinator.